I used to love the Fall TV season. But the last few years have disappointed me. There’ve been very few original, interesting new series, and the ones I let myself care about (Forever, Agent Carter) were cancelled too soon. I’d almost given up hope. Thank heaven for Fall 2016. This season brought a surprising array of shows worthy of a shot. One of those is the half-hour sitcom, The Good Place. Let me say that in order to enjoy this show, you have to suspend belief. I don’t mean ignore your faith, but take this show for what it is. Rather than a thoughtful look at what the afterlife might be like, it’s a whimsical caricature of what could be perceived as paradise, and a satirical take on what it means to be a good person. Eleanor Shellstrop (Kristen Bell) wasn’t a very nice person in life. She was selfish, unethical, and rude. Thanks to a mistake she ended up in the Good Place. Now, Eleanor needs to keep her secret, especially from Michael (Ted Danson), the architect of the neighborhood. If he finds out, she may be headed to the Bad Place, so she’s not taking any chances. The audience quickly discovers that, whatever their idea of heaven is, this isn’t it. It’s full of good people who lived good lives and now get to spend eternity in homes made just for them, eat as much frozen yogurt as they want (and there’s lots of fro-yo), and find their soul mates. When Eleanor meets hers, ethics professor Chidi (William Jackson Harper), she pretends to be elated, then she makes him swear he will never betray her, and then she confesses and says he has to help her learn to be a good person so she can stay. Chidi waffles, but finally agrees after he sees a flicker of redemption in her. The premise is wild and the humor is broad, but what really sells the show is the top-notch acting. Bell’s Eleanor is so sunshiny-adorable, she’s able to stealth-insult people with the aid of her engaging smile and the lilt in her voice. She makes Eleanor irritating, but also sympathetic, because we can see that she’s trying. As Michael, Danson gives us a congenial supernatural being (not God, maybe an angel) who’s so excited about his first time in human form that the prospect of trying out suspenders gives him the giggles. As Chidi, Harper has a wonderful, dry delivery that sets him up to be the perfect straight man. He’s also a little heartbreaking as he sincerely tries to help Eleanor, even though being with her means he’s NOT with his actual soulmate. 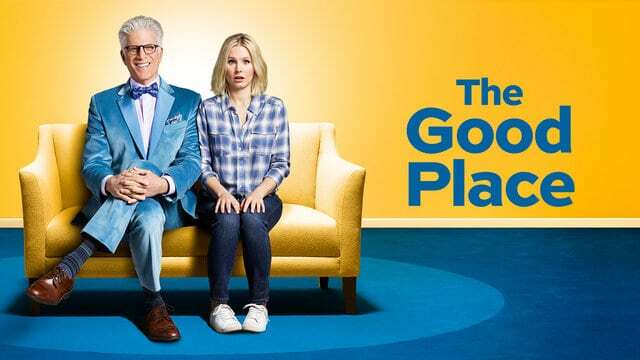 The Good Place is full of lots of funny bits (which I’ve left out so as not to spoil it for you) as well as a few things that may encourage deeper discussion with friends and family. Or maybe not. But if you need a good laugh, you might want to stop by The Good Place. I know I’m going back.